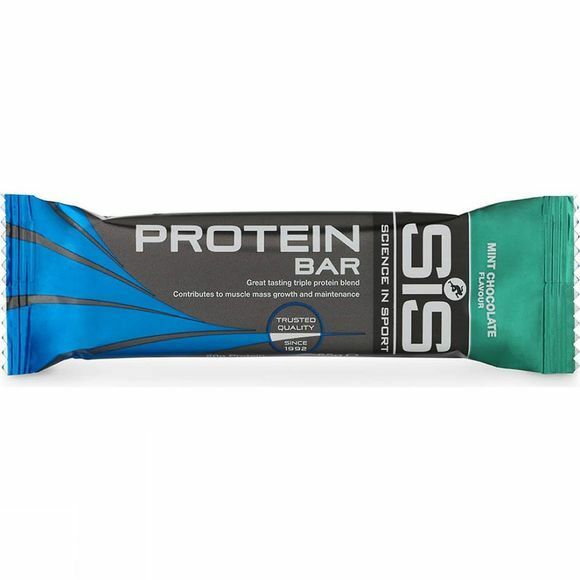 The SiS Protein Bar Chocolate and Mint contains a blend of easily digestible proteins (20 grams of protein per bar) in the form of whey, casein and soy protein. Sports scientists are increasingly recognising the importance of consuming protein in close proximity to training sessions (i.e. before or after training) in order to maximize how our muscles adapt to training. The importance of protein is also often overlooked by endurance athletes and for this reason SiS Protein Bars provide an appropriate quantity of high quality protein for before or immediately post exercise. Protein blend (25%) (calcium caseinate (milk), hydrolysed wheat gluten, whey protein (milk), soy protein, sodium caseinate (milk), glucose syrup, chocolate (18%) (sugar, cocoa mass, cocoa butter, emulsifier (soy lecithihn), invert sugar syrup, gelatine hydrolysate, soy crisps (soy protein, tapioca starch, salt), palm fat, reduced fat cocoa powder, sunflower oil, flavours, emulsifier (soy lecithin), salt.